This is a satisfying treat for cool nights. You can make it as spicy or as sweet as you like. If you don’t like the taste of curry, simply use a seeded chile for spicy flavor instead! This chowder takes only about 30 minutes to prepare once all your ingredients are assembled. Shuck and wash corn to remove all silk. Cut corn from cobs and save cobs. Set corn aside. Pick crab and remove any shells or cartilage. Set aside. Sauté shallot and garlic in olive oil and butter until shallots are translucent. Pour in coconut milk and stock. Add curry paste, if using and incorporate into broth mixture. Break corn cobs in half and add to broth. Bring to a slow, rolling boil and cook for 10 minutes. Add potatoes and chile (if not using curry) and cook until potatoes are soft, about 10 minutes more. 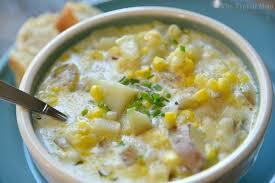 When potatoes are cooked, remove corn cobs from soup and discard. Add corn kernels and cook for 2 minutes. Remove from heat and add crabmeat. Season to taste with salt and freshly ground white pepper. Ladle into soup bowls and serve topped with cilantro leaves.